Lightweight aircraft aluminum body? Check. Able to adjust the flashlightâ€™s beam from wide to narrow with a flick of the wrist? Check. Push-button on/off? SOS and strobe mode? Small, â€œgo anywhereâ€ footprint? Check, check and check. We could also tell you itâ€™s the perfect light for your camping backpack, your glove box, or your bag, as it is approx. 5.4â€ long and 1â€ in diameter, but letâ€™s focus (pun intended) on the colors. Why? Letâ€™s say the power goes out and itâ€™s nearly pitch black in your kitchen. 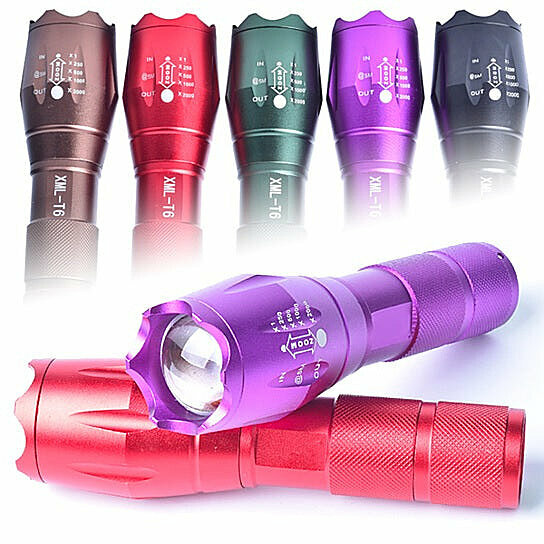 Whatâ€™s easier: finding the bright purple flashlight in your catch-all drawer, or locating the black one? Load it up with 3 AAA batteries (not included), and youâ€™ve got a small, powerful, feature-filled flashlight.